SystmeOne is the system of choice for all Northumberland GP practices. It is used in some hospital departments (such as the diabetes centre) walk-in centres, hospices and by the District Nursing and Health Visiting services. The aim is to have a more joined-up medical records. It will be easier to share urgent medical information electronically - please let us know if you object to this and we will mark your records accordingly. Be aware though, that we will always share whatever information is needed to keep you safe - if we can't share it electronically it will go by phone, fax or letter. We only ever share what we believe to be the safe and correct amount of information, and with the right people. Patient data is never treated casually. Patients will possibly be aware that GDPR came into force in May 2018 - you can read our policy statement by clicking on the tab to the right "access to health records". NHS Choices and Patient Info each have information about a wide range of medical problems and symptom checkers. If you want some guidance about symptoms you may be having you can look there first and learn about how to look after yourself in the first instance. There is also a link to the right hand side of this page called "Be Self Care Aware" and another on "Finding Further Help" which will direct you to other organisations who offer specialist support for problems such as mental health. We are training members of our staff to be Care Navigators. 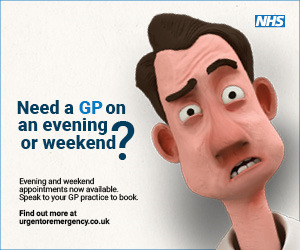 This is an NHS programme designed to direct patients, with the doctors' support, straight to the best source of help. Often a GP is not the right person to help with a range of problems! The Care Navigators will therefore be asking more of our patients why they are coming to see the doctor. As we develop the scheme, we will post more information about it on this website. We have been producing a regular practice newsletter since November 2015. You can sign up to receive an email copy or pick up a paper version from the waiting room. We hope to produce an issue every 2 or 3 months. The surgery is accessible to patients using a wheelchair. Disabled toilet facilities along with a baby changing area are also available. If you require any assistance the reception team will be more than happy to help. If you have a special need, please let us know when booking your appointment.